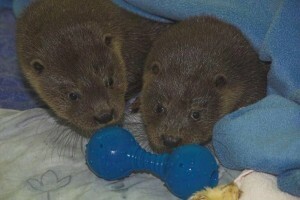 Stay in touch with extra news updates, such as the latest update on our rescued otter cub, Gribun. Terry, Nigel, Marie, Julie and Loki, the dog. 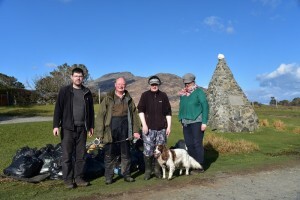 Yesterday, the Mull Otter Group returned to Lochbuie to finish the beach clean they began on March 6th. 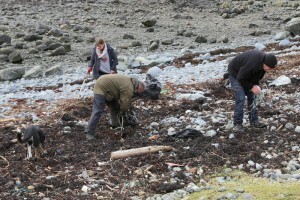 Despite the fact that only 4 people turned up, we managed to clear the main beach at Laggan Sands. About 25 bags of rubbish were collected along with the usual collection of larger items such as fishing crates, containers, and large pieces of rope. 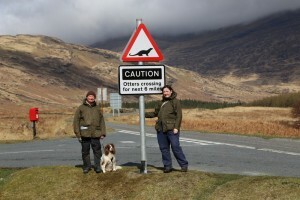 Today the Mull Otter Group completed the erection of their second road sign on Mull that alerts motorists to the fact that otters cross our roads. 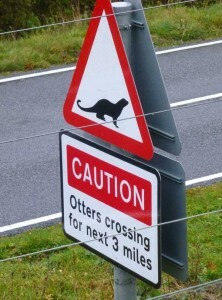 This road sign is at the Kinloch junction, just before Pennyghael, and the hope is that otters on the South of the island will now be a little less likely to collide with cars as they make their way between the shore and their inland retreats. 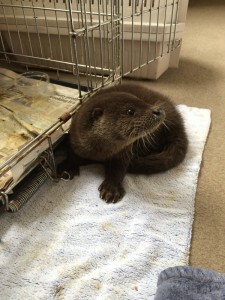 Mull Otter Group were called out to rescue a very poorly otter cub at Gribun, Mull on 23rd March. Things did not look good for this little cub, and it was by no means certain that it would survive the night. But, after being rehydrated, and receiving some special care and attention from Jane Stevens, our Chair, it soon perked up. The otter cub was named Gribun, after the place where he (or she) was found, and soon started to feed well, and become more active. Mull Otter Group volunteers are still nursing their sore backs and blisters after a hard day’s work culvert cleaning and beach cleaning on Sunday. MOG Clean-Up for the Queen! Well done! and a huge THANK YOU to all who travelled the road and the miles to remote Loch Buie, in South-East Mull, to help MOG and Mull-Adopt-a-Beach clean for the Queen earlier today (Sunday 6th March). 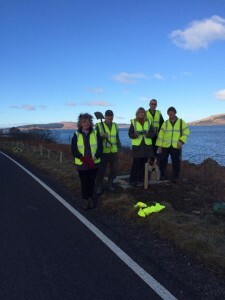 On Sunday Mull Otter Group volunteers helped with the installation of roadside reflectors in an effort to reduce otter RTAs. This is a work in progress as we trial them for the first time on Mull. With over 25 otter deaths on our roads each year, we are hopeful that if they are successful we will install them in other areas where otters have been killed by vehicles. 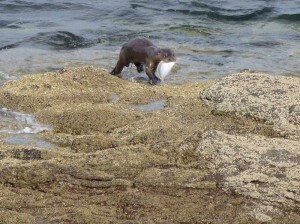 Mull Otter Group is attempting to harness support for an island-wide scheme that seeks to encourage individuals, families, groups and organisations to take greater responsibility for (some of) the mess we humans leave behind. As Winter storms deliver a new batch of assorted debris onto our coastline, now is the time to mobilise thought into organising clean-ups to take place this Spring. This is vital, not only from an aesthetic point of view, but it also helps protect wildlife that may be at risk of injury or death from discarded plastic and glass. Thanks to everyone who attended this afternoon’s AGM at the Isle of Mull Hotel in Craignure (Sunday 29th). A brief rundown of the achievements of the past year, as well as a fundraising forecast for the next 12 months, was preceded by a short presentation on ‘Otters and Road Mortality’. This talk highlighted the research carried out by Lesley-Anne Jeffrey into culvert use by otters on the Isle of Mull, as well as gauging public awareness into road traffic collisions involving wild animals on the island. Lesley-Anne was able to conclude that the installation of roadside reflectors was (probably) the best way forward in helping alleviate the problem of otter road deaths on the island in future. MOG has accepted this and will be putting a number of reflectors on trial at a known otter mortality black spot commencing in 2016. 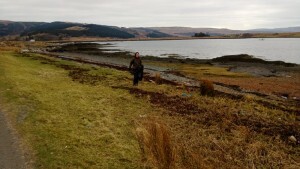 Thank you to Lesley-Anne for taking this occasion to come to the Isle of Mull, in order to share the results of her research into a subject that has no easy answers.